What type of Necklace Styles are in fashion? There are many gold and silver necklace styles available, each serving different purposes and offering different effects to the wearer. Below we list the more popular chain styles. 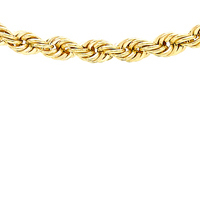 Similar to the Figaro chain (discussed below), except the Anchor chain alternates a single, small, round link with a larger oval link. These links resemble the chain attached to an anchor on a boat, hence the name. Available in a range of widths and popular with men in particular. Comprising of oval interlocking links with alternate links turned 180°. This chain comes in a range of widths; smaller chains being more popular with females and larger, chunkier chains with males. 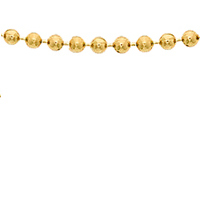 The ball chain has round beads fixed along a chain, either with some distance between each bead or, more popularly, strung close together with a small space in-between (as pictured). Popular for use with pendants, particular dog tag pendants. 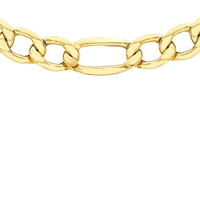 Box chains have square links rather than round links, giving the chain a ‘boxy’ appearance. 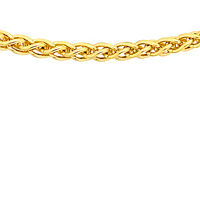 Thinner versions of box chains are popular for women’s jewelry and often paired up with pendants. Thicker chains look great work by men or by women as statement pieces. 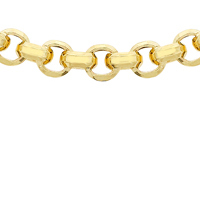 Curb chains are a very popular choice, particularly with men as they are available with heavy, large links. The curb is a simple and classic design of flat, interlocking, identical links. Historically, the links were large as they were made with very little machinery and hence were very time consuming. Nowadays however, with the advent of modern machinery, smaller and more feminine curb chains are available. 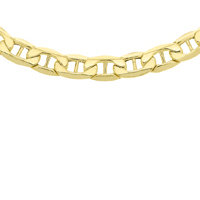 Smaller curb chains work well with pendants and diamond cut or twisted curb chains tend to reflect the most light. 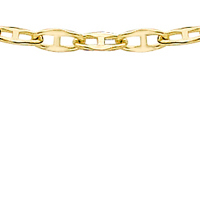 The Figaro chain has flattened links which vary in size. It usually has 2 or 3 shorter links alternating with a longer link. Figaro is a style that originated in Italy and is popular with both men and women. Shop for a necklace today. Very similar to the anchor chain but the links are round as opposed to square. 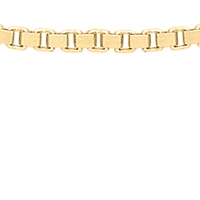 A wider Gucci chain can make a great statement piece of jewelry. 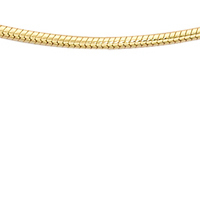 Smaller Gucci chains are very pretty and a popular choice with pendants. Rope chains are chains where small links are manipulated to avoid calling attention to their appearance; instead, they are linked in a twisted pattern to resemble a genuine rope. Rope chains come in both delicate versions where they are a popular choice for pendant necklaces, and heavier versions where the chain itself is the main attraction. Rather than visible links, snake chains are made up of rings which fit together closely, making a chain with an appearance of a flexible tube and the texture of snakeskin. Snake chains are usually narrow and delicate. Again, a great choice for a pendant. The Singapore chain is a ‘twist curb’ chain. The Singapore is made of twisted and braided fibers. Known for its strength, integrity, classic pattern and simplicity, this is a popular choice with those looking for a pendant chain. 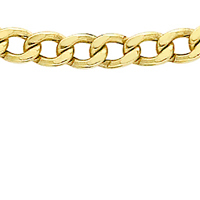 Spiga or Wheat chains are normally created with four strands of twisted oval links. 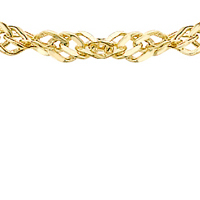 The links are braided and woven together to make a lovely looking chain that is quite eye-catching! Come in to luxamart today for the greatest value for your jewelry needs! We buy and sell diamond rings, gold, silver, platinum and coins. We also sell and buy luxury watches, rings, necklaces and much more. We are located in booming frisco, TX at Lebanon and Preston Rd. Should I sell my gold?Where can I Repair Jewelry in Frisco?